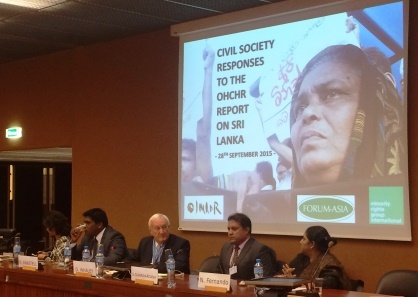 On Monday 28th of September, during the 30th session of the UN Human Rights Council, the International Movement Against All Forms of Discrimination and Racism (IMADR), jointly with Asian Forum for Human Rights and Development (FORUM-ASIA) and Minority Rights Group International, hosted a side event entitled: “Civil Society Responses to the OHCHR report on Sri Lanka”. This unique opportunity took the form of open panel discussion with Sri Lankan civil society representatives from different ethnic and religious communities. They shared their responses to the OHCHR report and discussed the steps that need to be taken in order to reach truth, justice, accountability and reconciliation in the country. The large audience consisted of people from international and national NGOs, Sri Lankan civil society, Tamil Diaspora, and State representatives. 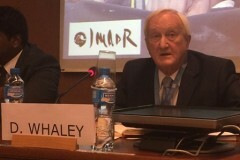 Mr. David Whaley, the moderator of this side event, opened the panel discussion by reminding the audience that the Human Rights Council should be a forum for victims to express themselves and give the opportunity for international actors to take action in their behalf. The first speaker who took the floor was Mr. Sudarshana Gunawardana, a human rights defender working in Colombo for the group “Rights Now Collective for Democracy”. He started his presentation by saying that, since the January 2015 election, space has opened up in Sri Lanka. He is therefore optimistic but cautious. He then stressed the importance to recall that the OHCHR report is the result of long and collective efforts. All the communities composing the Sri Lankan society had to work together and gather their force to uproot the previous government and demand genuine political will for truth and justice. He finally declared that independence of media is still an issue in the country. He explained that free and independent media has a critical role in upholding high standards of governance and should be promoted by the Government of Sri Lanka (GoSL). The second speaker, Ms. Shreen Saroor, is a Muslim representative and one of the founders of “Mannar Women’s Development Federation” and “Mannar Women for Human Rights and Democracy in Sri Lanka”. She focused her presentation on sexual violence. 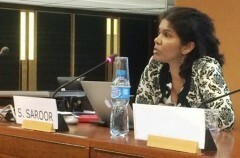 She welcomed the fact that the phenomenon of sexual violence in Sri Lanka has finally been described in the OHCHR report as systematic and structural. She noted that acts of sexual violence and torture by security forces continue to be reported in the militarized part of the country. She urged the Government to immediately take measures to put an end to these abuses. She then expressed her real deep concern with regards to the Sri Lankan peacekeeper’s operations. She denounced horrific sexual violence they committed on Tamil women during the civil war. According to her, Sri Lankan peacekeepers should not be deployed anywhere else before prosecution takes place and justice is made for the hundreds of women who suffered appalling violation of their rights. She declared that without real reforms and adequate training, Sri Lankan peacekeepers would continue to abuse their power with impunity where they will be deployed: “We need to protect women around the world”. She finished her presentation by calling upon the High Commissioner’s Office to follow closely the implementation of the report’s recommendations and to request from the Sri Lankan government regular follow ups. According to her, a heavy involvement of the international community is essential in order to genuinely improve the human rights situation in her country. 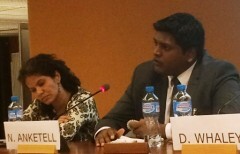 Mr. Niran Anketell, a Tamil lawyer based in Colombo, started his presentation by welcoming the consensus resolution which includes key set of civil society’s demands such as: the international involvement in the transitional justice process and the repeal of the Prevention of Terrorism Act. He admitted that the resolution could have been better, nevertheless he asked to keep in mind that, for the first time, the GoSL co-sponsored the resolution: compromises were therefore vital for the negotiation to take place. He then discussed the Sri Lankan judicial and legal system. According to him, there are fundamental flaws in the actual system and a hybrid mechanism is primordial to address human rights violations in Sri Lanka. He gave the example of the Attorney General department, which is strongly politicized and corrupted, and failed in the past to investigate efficiently alleged human rights abuses. He declared that interferences by political actors in all stages of investigation are very common. The participation of the international community in a mechanism for truth and justice is necessary in order to protect future investigation from politicisation. He is aware that Sri Lankans do not unanimously support the establishment of a hybrid mechanism, however he declared that people stating that the Sri Lankan constitution does not allow such mechanism are only using excuses and masks for other political concerns. The Government has now to sell the idea of a hybrid court and promote it in the country: “It is only a political matter”. He finished his presentation by stating that the new Government should review as soon as possible the Witness Protection Act to meet international standards. 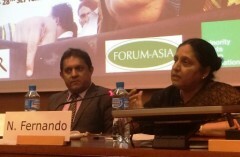 Ms. Nimalka Fernando, IMADR’s president and human rights defender in Sri Lanka, was the last speaker to take the floor during this panel discussion. She started by declaring that, although the implementation of the OHCHR report’s recommendations is going to be long, she is not pessimistic. She witnessed the Government’s change of attitude and its openness to acknowledge the terrible human rights abuses perpetuated in Sri Lanka. Politically, this new position represents a huge step and the GoSL distances itself from the previous governments. She declared that after 6 long years of struggle, lobbying and hard work from the Sri Lankan civil society, the report is out and that “time for healing has come”. She reminded the audience that the terrible human rights violations occurred during the war, were not only the result of Sri Lankan government’s failure but the failure of international community as well. Therefore, the UN system has a responsibility in supporting the GoSL to address these human rights abuses. Finally, she put a strong emphasis on the urgent need to translate the OHCHR report in Tamil and Sinhalese. The population concerned need to access its content and the GoSL has to start the discussion and consultation with the affected communities as soon as possible. In the second part of this side event, the moderator opened the floor to the audience for comments. Many points were raised. Some people expressed their fear and their mistrust in the GoSL. They declared that the GoSL made a lot of promises in the past and never implemented them. “How can we trust them to translate words into actions this time?”. Moreover, some individuals see in the GoSL’s behaviour a bad sign for the future. For them, the GoSL political position concerning the need of investigation in order to “clean the honour of the Sri Lanka soldiers” is deeply concerning and counterproductive. An individual raised the point of the need to be extremely careful with the translation of the report into Tamil and Sinhalese. He heard rumour amongst Sri Lankans, that the OHCHR report is not asking for a hybrid mechanism and that the international community will only have a role of observer in the transitional processes. Manipulation of words’ meaning can be used to deform the OHCHR report’s recommendations and this question should be taken really seriously. Someone noticed a grave omission in the OHCHR report: there are only two short paragraphs concerning the history of Sri Lanka and how past politics led to the civil war. “It is essential to think about how we get here” in order to guarantee non-recurrence of such human rights abuses in the future. Other individuals were more optimistic and they welcomed the OHCHR report and the new GoSL position. They made further suggestions to strengthen the civilian trust and confidence such as: to request the GoSL to report to the Human Rights Council on the transitional processes more regularly and to open an OHCHR office in the north/east of the country. Numerous participants admitted that the resolution could have gone further, but stressed that the OHCHR report is a good start and gives tools to the civil society to continue the fight for truth, justice and reconciliation. 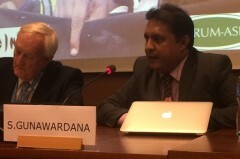 The moderator closed the panel discussion by thanking the courageous victims for coming forward to report their traumatic experience; the UN officials for resigning from their position to denounce the horror of the war; and the Tamil Diaspora and human rights defenders for finding new ways to interact with the international community in order to keep Sri Lanka’s human rights crisis on the international agenda. He declared that the release of OHCHR report is the result of their courage and persistence. Share to the Sri Lanka communities a full and accurate translation of the OHCHR report. Strengthen the OHCHR capacity in Geneva, Colombo and on the ground in order to participate in the implementation and follow up of the OHCHR report’s recommendations. Make sure that the international community and civil society follow up the measures taken by the GoSL to implement the OHCHR report’s recommendations.